Saturday, July 26: The first Giant Swallowtail of the summer brood was spotted today at Ojibway. 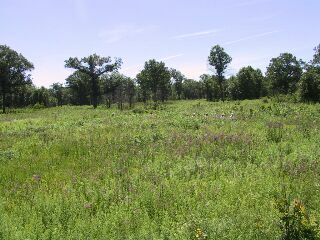 This is a great time to visit and see a large variety of flowering plants as the prairie is approaching its peak of bloom. Click here for a list of species. Three new species have been added to the collection of photographs on our lady beetle page. Wednesday, July 10: A large female Spiny Softshell was observed by many people as it laid a clutch of eggs in a patch of bare ground along Turkey Creek. Jerry Potma provided the nature centre with a photo of the big event. This is the first record of a softshell turtle in the Ojibway area. Saturday, July 6: Fifty species of butterflies were recorded today on the Windsor Butterfly Count. Best finds included Pipevine Swallowtail, Hoary Edge Skipper and Dreamy Dusky Wing. Complete results are available on the butterfly count page. While searching for butterflies Karen Cedar found ten Eastern Prairie White-fringed Orchids in bloom at Tallgrass Prairie Heritage Park.